An otherworldly cloud phenomena found high in Earth’s atmosphere is becoming more visible due to our greenhouse gas emissions, according to a new study published in Geophysical Research Letters this month. Noctilucent, or night-shining, clouds look like wispy shimmering sky webs formed from ice-crystals. Unlike most clouds that appear, at most, approximately four miles (six km) high, these clouds form at ultra-high altitudes of over 52 miles (83 km), in a brutally cold section of Earth’s atmosphere known as the mesosphere. The clouds are typically observed in twilight, showing their subtle white glow only when the Sun is below the horizon. They’re also more common during the summer, when these middle-atmosphere altitudes are coldest. These spectacular clouds were first spotted in the 19th century following Krakatoa volcano’s famous 1885 eruption, which “spewed massive amounts of water vapor into the air” according to a press release. Since then, bright noctilucent clouds have been spotted with increasing regularity. “Scientists have been wondering for many years if or not these clouds are an indication of anthropogenic change,” Franz‐Josef Lübken, director of Leibniz Institute of Atmospheric Physics and lead author of the study, told Earther. Lübken and his colleagues set out to figure out if that was indeed the case. They wanted to parse out what factors, like water vapor and temperature, have the most influence on what noctilucent clouds are doing. 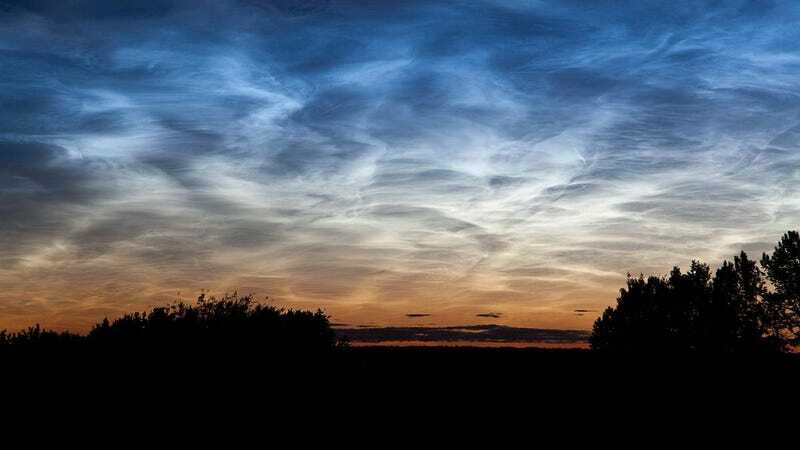 They used climate models and satellite observations to simulate the effect of fossil fuel burning since the Industrial Revolution on noctilucent cloud formation. The study found that an uptick in water vapor in the middle of the atmosphere was key. Water vapor concentrations have risen largely due to the production of methane, a greenhouse gas that becomes oxidized and converted to water vapor in the mesophere. This water vapor freezes around specks of dusts from incoming meteors, becoming ice crystals that form noctilucent clouds. More water vapor in the middle atmosphere means ice crystals that are larger, which in turn makes noctilucent clouds more visible. Follow up research will investigate whether out continued methane emissions will have an impact in terms of how much solar radiation is absorbed by these high-altitude clouds. Meanwhile, if you want to get a glimpse of these night-shining clouds, you’re in luck. According to Lübken, for cloudspotters residing in high latitudes—say, 50 to 70 degrees north—they should be visible through August. I was born a while ago and now I'm here. Pretty rad.